Almost identical to original equipment clutch plates the CK series are a cork based product impregnated with aluminium particles to increase wear life and heat resistance. Material is highly compressed to avoid swell and clutch drag and is an ideal general purpose replacement material for all grades and sizes of motorcycle. Kit includes a complete engine set of friction plates only. EBC Kevlar performance replacement Clutch. Kevlar paper lined plate set complete with heavy duty clutch springs (excluding bikes with diaphragm style springs), the SRC kit is ideal for heavy sport bikes, faster riders and production based race use. Advantages of the SRC Kevlar series are longer life, higher heat resistance, although this clutch has a more aggressive/faster take up than the CK cork series. The new EBC SRK comlete clutch kits include Kevlar fibre lined friction plates, steel drive plates and springs to provide a streetgoing kit for high performance street and road race use much similar to the DRC program for off road. Some of the kits will now feature new diaphragm springs as used in many larger new bikes to provide a complete clutch rebuild kit for every sportbike possible. Always fit new springs which get tired after miles of heat and use. EBC spring kits are 10% stiffer than standard and are sold in engine sets. Please note : the lever will feel slightly 'heavier' when uprating springs, test ride to acquaint yourself with this change in control. These are a dish shaped flat steel pressure ring and there are normally only 1 or 2 in a bikes engine, you should never add MORE springs on a diaphragm spring set up. If you do wish to upgrade the clamp load and your bikes is fitted with a diaphragm spring clutch kit buy an EBC Brakes spring kit, all of which are built with 10-15% more clamp pressure than stock.This can again reduce clutch slip and premature clutch wear. 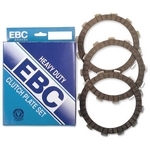 Made in the UK by EBC Brakes these laser cut clutch tools make clutch removal, loosening of the drive shaft bolts and re tightening a breeze without any fear of damage to your expensive clutch basket. Do not use tyre levers or screwdrivers for this job as expensive damage can result.The tools can even be extended to create more leverage if required with any simple workshop tool or simple tube but the tools themselves are an essential and very low cost item for clutch replacement.EBC strongly recommends the use of these tools for all clutch work and compared to the high prices of manufacturers tools these are very much value for money and a worthwhile buy. Drive case OIL is extremely important and riders should never use ATF (Automatic transmission fluid) which has been tried in the past to reduce oil drag and gain half a horsepower.It does reduce drag and it does give you a tiny HP gain but it ruins your clutch in minutes. Always use the bike manufacturers oil and fill to the right level, another not so clever trick used to gain a tiny power increase is to reduce the oil level in the drivecase, Oils must cool the clutch as well as lubricate it, never cut corners here and never put additives of any sort in drivecase oil which cause plates to stick and glaze, invalidating your warranty and ruining your clutch.